PLAINVIEW, NY -- ELMO USA Corporation is proud to announce the anticipated release of the TT-12, a fifth generation model in the exceptionally popular “Teacher’s Tool” line of classroom document cameras. 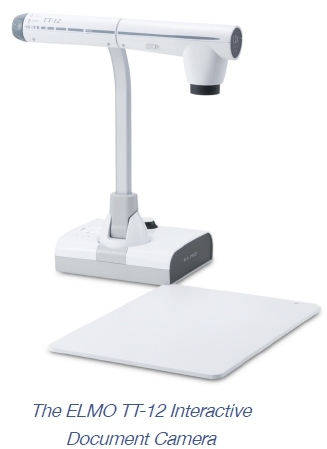 The ELMO TT-12 is an all-inclusive document camera designed for teachers looking to incorporate 21st century classroom technology to create dynamic lessons that enhance learning, interaction, creativity and academic performance of students. ELMO, as a leading document camera manufacture, is committed to providing teachers with state-of-the-art document camera technology. 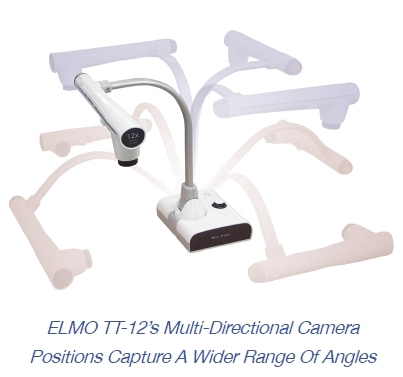 The ELMO TT-12 maintained the compact and user-friendly design of original Teacher’s Tool, but enhanced with several new features that include multi-directional camera positions to capture a wider-range of angles for object situated in unique positions. The ELMO TT-12 also premiers an enhanced 12x optical zoom and 8x digital zoom with auto/manual focus that renders crisp, clear images up to 96x magnification. Bright and colorful images are captured through the ELMO TT-12’s 3.4 megapixel camera, and smooth, full-motion video is displayed at 30 frames per second. Teachers and students will appreciate the ELMO TT-12’s use of internal SD/SDHC/USB memory to capture images and record video without the need for a computer or external storage device. The ELMO TT-12, in addition with the ELMO CRA-1 wireless tablet, also provides teachers the ability to conduct lessons with or without a computer. Additional ELMO TT-12 features include a logically designed control panel, ergonomically designed remote control, and the latest version of ELMO USA’s popular Image Mate Software. Through the unit’s USB interface, Image Mate Software users connect via computer to access a suite of annotation tools to create presentations and add in effects for greater visual impact. ELMO’s TT-12 document camera comes with a five year warranty and will be available in September 2011. For more information on the ELMO TT-12 model and other ELMO educational technologies, please visit www.elmousa.com.